Ayes to the right: 202. Nos to the left: 432. The Nos have it by 230 votes. 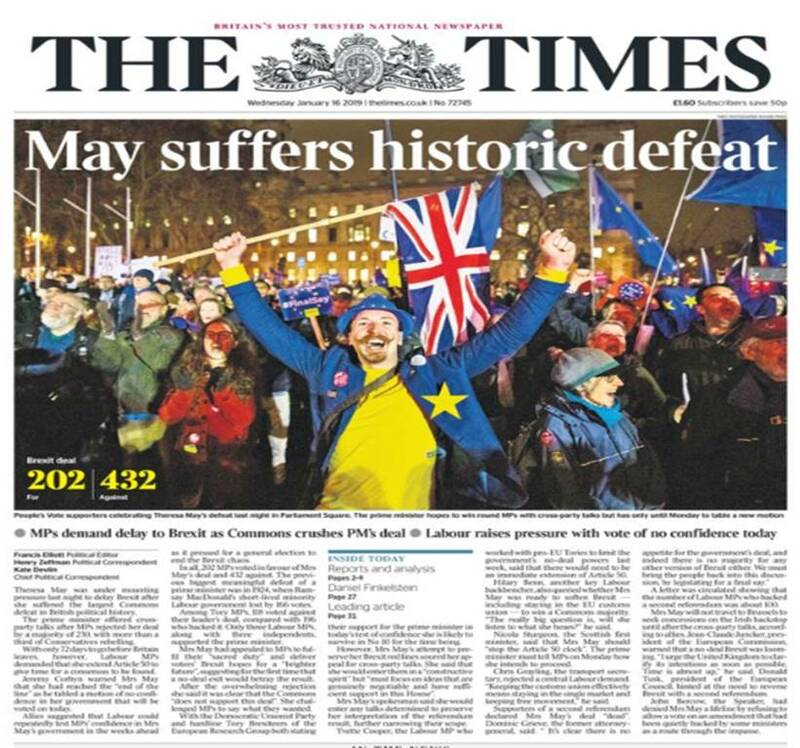 Everything that can be written about last night’s historic House of Commons defeat of Theresa May’s Brexit deal has been written, except for one thing. I would now make it mandatory that anyone wishing to enter national and international politics must spend at least ten years in an industry, any industry, that has to create and sell products to remain in business. And I mean “create and sell products” not “provide a service”. In so doing, politicians will learn the arts of negotiation, compromise, project management and working to deadlines, marketing and sales, leadership and, most importantly, the principle of reciprocity. If you look at the career paths of Theresa May, Jeremy Corbyn, Donald Tusk, Jean-Claude Juncker, Boris Johnson, Jacob Rees-Mogg, David Cameron, Michael Gove, Dominic Raab, Michel Barnier and pretty much any other politician who has been Brexit-prominent over the last two years or so since the 2016 referendum, you will see that, before embarking upon a political career, they either worked in a government organisation (May); or was a trade unionist (Corbyn); or a political opinion writer or journalist (Johnson, Gove); or a lawyer (Raab); or emerged from “soft” service industries such as finance (Moog) and media/spin (Cameron); or were career politicians from day one (Tusk, Juncker, Barnier). I’ve worked in factories (aircraft assembly industry, automatic electronics test industry, software industry), in start-ups (where every day is focused on survival), in American companies (where considerable attention and training in management skills are de rigeuer), and as a one-man-band (where technical and personal skills, and ensuring repeat business, are paramount), and I’ve seen what it takes to get products out of the door, on time, and to the satisfaction of the customer. I have not observed any of these management and production skills in the people who have tried to implement the results of the 2016 referendum. What I have seen is massive faffing around, massive protectionism (of jobs and policies), massive ambiguity and fluffiness of statements of intent, and massive incompetence. Like everybody else, I have absolutely no idea what will happen now, both before and after March 29. All I know is that the same people who created the mess will now try to solve the problems they’ve created and I have zero faith that they will succeed. Brexit is well and truly fubared. For once, I agree with Trump’s statement. Brexit is indeed “well & truly fubared”. Good word that – WW11 acronym – I had to look it up! Not only is Brexit fubared. It’s also snafued! I wholeheartedly agree that anyone entering politics should have experience of working in some form of industry. They need to have experience of life in the real world. To date I haven’t seen any of those essential managerial qualities that you mention. I’m off to stock up my supplies – she lies!!!! You will need tins of baked beans for fibre and carbs, buckets of water to wash your face and clean your teeth, and bottles of wine in case you get thirsty. And, don’t forget the torch, piece of string, and a penknife “just in case”. Good luck! Would you really prefer Presidents Juncker (European Commission) and Tusk (European Council) to reign over you? And don’t let’s forget President Tajani (European Parliament). The thought of a trinity of three presidents invokes shivers worse than any horror movie I’ve ever seen! But, you are correct. The current UK political system is not fit for purpose. Maybe we should return to anarchy or localised tribes with minor kings, queens and chieftains. Or wait two years and then import Donald Trump and give him free rein to do the necessary!